The PCI application is now widely used and has replaced the ISA system. PC-based interfacing and I/O experimentation had been based on the ISA (Industry Standard Architecture) bus, however, the PCI (Peripheral Component Interconnect) bus, makes it much more difficult for users to interface their own circuits directly to the PC. The PCIDT rectifies this situation enabling the experiments to be carried out via the PCI bus. The PCIDT provides a solution for teaching PC-based interfacing to various I/O devices on modern PCs using the PCI bus. Pre-written experiments cover I/O devices from switches and 7-segment displays and A/D and D/A conversion to the optional DC and stepper motors. A complete introduction to PC interfacing covering PC interfaces and how to connect a range of common I/O devices is provides along with twelve experiments, with their program listings in assembly language and C, based on the PCIDT’s pre-wired circuits. Using the exercises in the textbooks and tools, users are able to learn quickly in controlling I/O under Windows through a PCI interface card. Users can develop and learn PCI I/O control, in addition experiments with C or VB language. 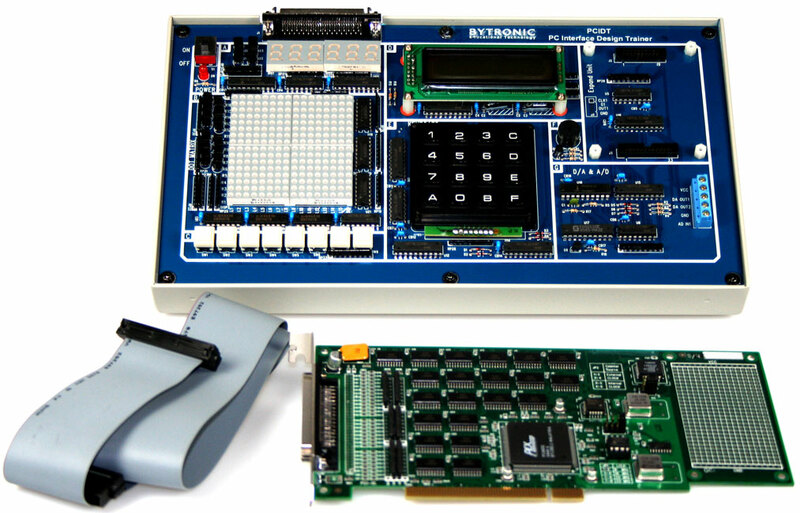 The system contains two main units: the interface card and the experiment platform. The design ensures that none of the experiments require soldering. The unit is enclosed in a strong and durable case.